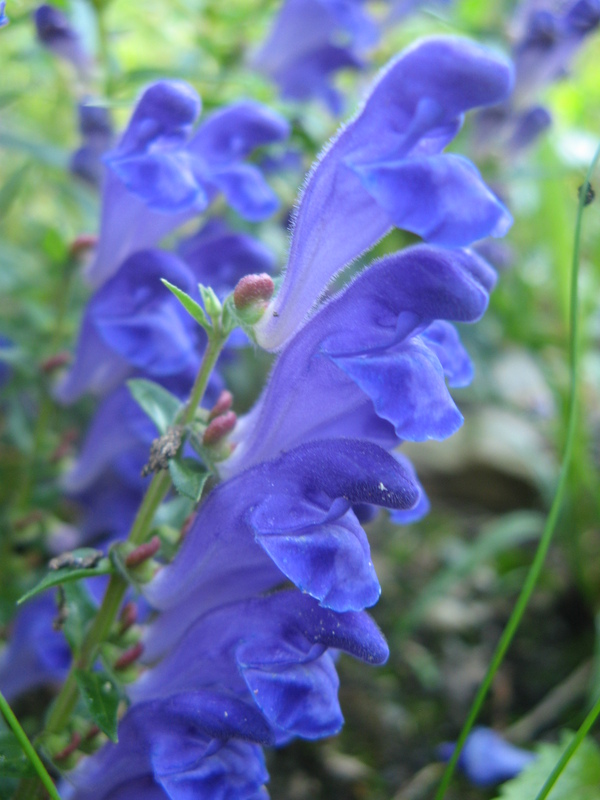 I am utterly smitten with baikal skullcap (Scutellaria baicalensis) for so many reasons, but the most significant is its unbelievable, otherworldly shade of indigo blue. When it first appears in the garden in late July, I jump about excitedly and preen over it with adoring eyes, but it’s really now, in late August, that the true heart-throbbing begins as the plants at Patera are covered in blooms that simply glow. The sky literally pales in comparison. Perhaps you can see in the photos above the small maroonish “caps” on the calyxes which then swell in size once the flower is dropped, as in the bottom right photo. These caps appear on both our American skullcap and this Chinese skullcap, or huang qin as its also called, though the whole presentation of baikal skute is so much showier. I’ve read various accounts of the inspiration for skullcap’s name–the cap-like shape of the upper lip of the flower or this little cappish protuberance on the calyx. 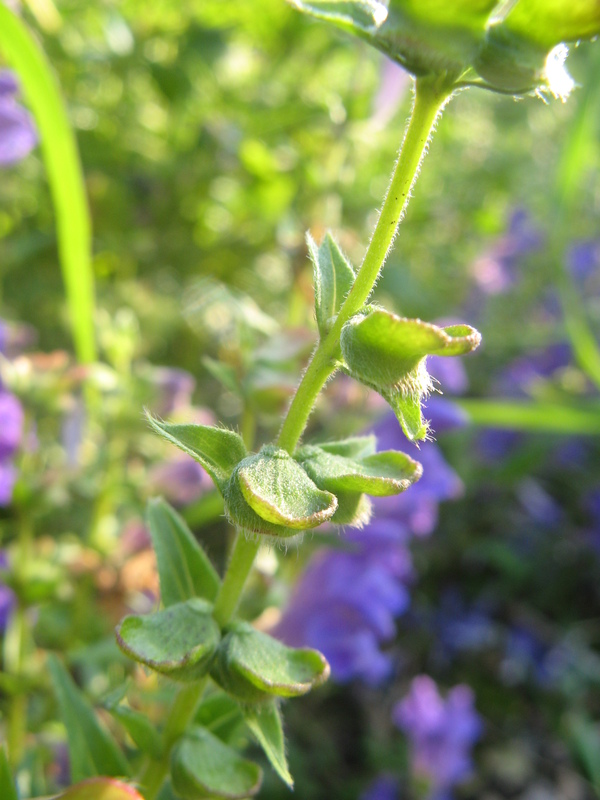 Honestly, the flower of the local skullcap (Scutellaria lateriflora) doesn’t have such a fancy hat shape, so I always wondered about the veracity of this. The rakish green calyx beret you see here seems a much better bet for inspiring namers! This little cap is very important to the signature of these plants, which I experience as powerfully calming the racing and anxious mind by “putting a lid on it”. Sometimes when we seem to be spinning out into the ethers with thoughts and emotions, skullcap gives us a little containment, cools us off, soothes the edges. 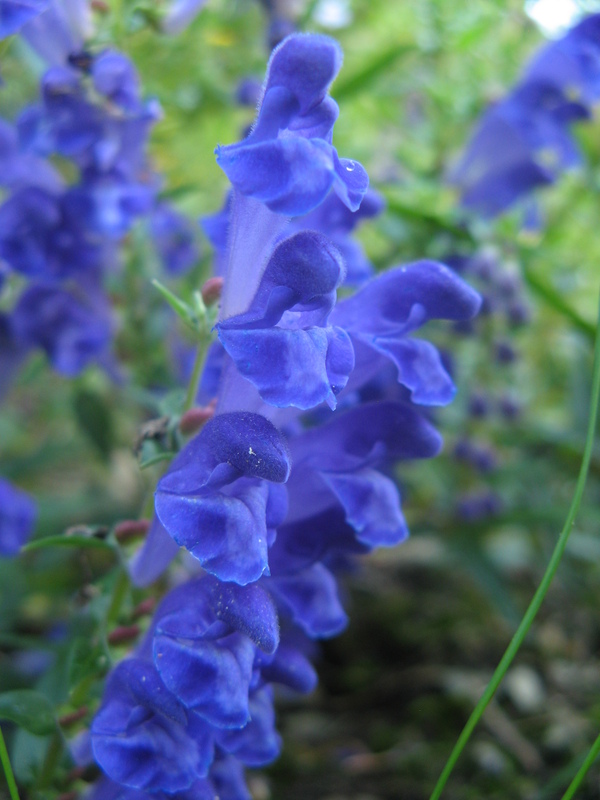 American skullcap serves as an important foundation for clients with anxiety, panic attacks, mania, irritability, and bipolar disorder, not to mention Tourette syndrome and even seizures. It can’t be beat for relaxing folks into sleep, especially when tension is held in the body, as in restless leg syndrome, or simply for people who tend to be fidgety and tight. By promoting GABAnergic activity (GABA is our primary inhibitory neurotransmitter), it reduces tension in body and mind. Coming from the mint family, it’s no surprise that these scutellarias would be cooling and relaxing nervines, but what’s interesting to me is that they are used in some unique ways in their respective traditions. The yellow root of baikal skute is used, where we use the aerial parts of American skullcap. They both have a curious greenish flavor, slightly bitter, but American skullcap leaf tastes more characteristic of plants with iridoids in them (in this case catalpol), so it’s reminiscent of plantain or vervain. If you eat a baikal skullcap leaf (not the medicinally used part), it tastes incredibly sweet. I’ve asked Sarah if there is use of aerial parts in TCM, but it seems not. This is most curious, as it’s downright delicious (but obviously some important, and less tasty, chemistry is missing from the leaves). 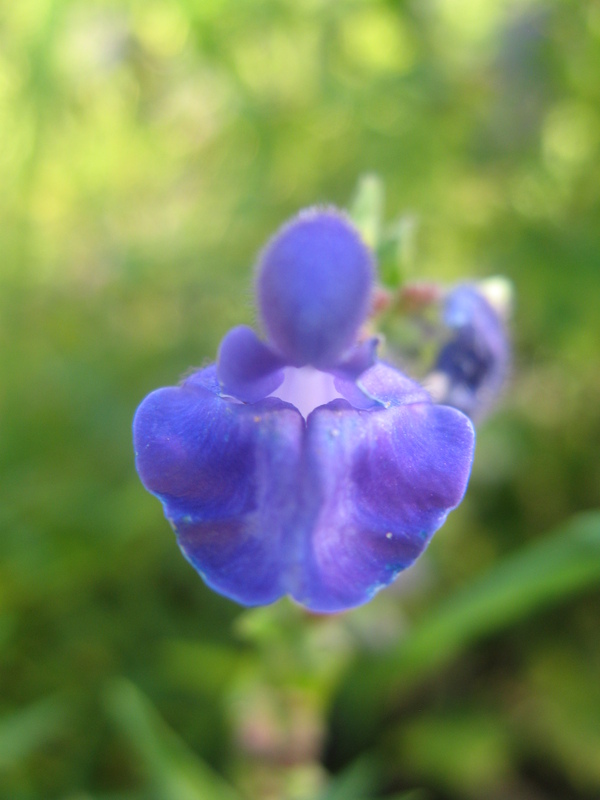 As I mentioned, the primary use of American skullcap is as an anxiolytic, while the main uses of baikal skullcap are for inflammatory conditions, especially of the cardiovascular system, liver, and lungs. It’s also used for cancer, especially of the lungs. During the H1N1 scare, I recommended it to folks concerned about an excessive immune response damaging their lung tissue in the later phase of the flu, and it’s similarly useful in the hyperactivity seen in autoimmunity. I also often offer it in combination with reishi for asthma, especially related to allergies. In TCM, the heart and lungs inhabit the upper burning space (aka jiao), along with the mind (which includes the brain, but also our spirit and emotional selves). So, as a plant with affinity for the upper jiao, it follows that baikal skullcap is also used by Chinese herbalists to cool and calm the mind and spirit, echoing the common application of its North American cousin. However, this use of baikal skullcap is less common in Western herbal practice and receives far less attention from the research community. Baikal skute is a prolific perennial, blooming in its first year and ready to harvest as early as the fall of its second. 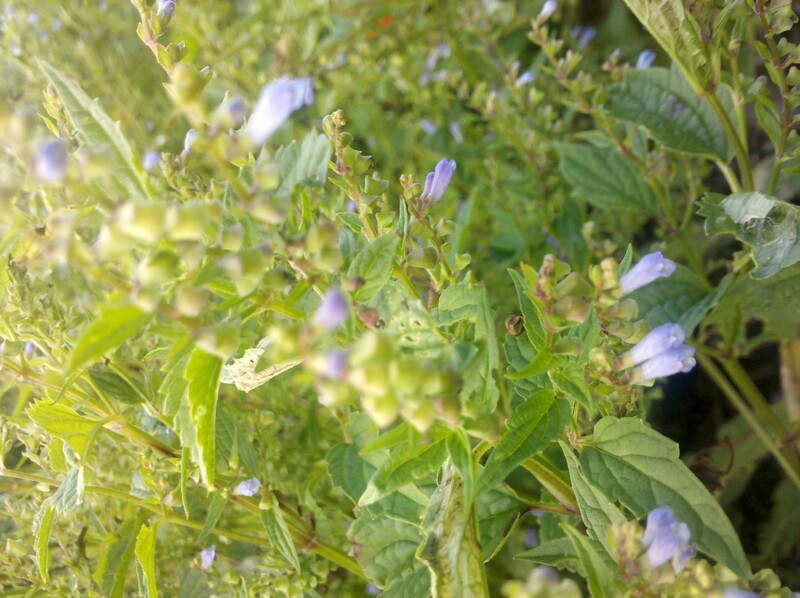 It’s incredibly easy to start from seed each year to ensure a continual presence and has no pest problems, like the evil beetle of skullcap death that ravages our local species. 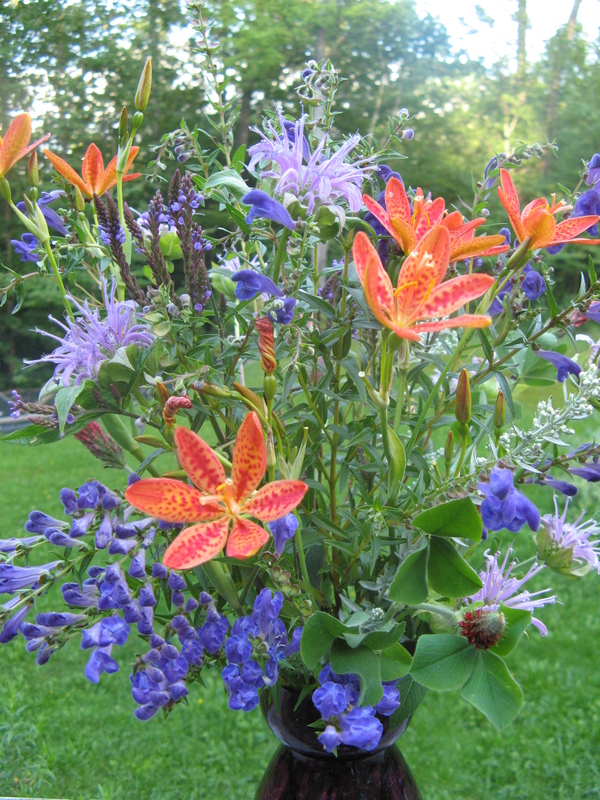 All it asks is full sun and good drainage, which it gets plenty of in its respiratory-oriented bed, tucked in with the blackberry lily, sage and lobelia volunteers. Even though our local skullcap is an absolute staple of my practice that I will never abandon, I admit to being wooed by the magical, brightly-hued stranger. Like a sighting of the elusive indigo bunting, its arrival in my garden has almost ruined me for less showy companions. In ancient Greece, a patera was a bowl to hold medicine, especially associated with the goddess Hygeia, daughter of Asclepius. She offered preventive medicine and sustained wellbeing to humanity, but only to those who took initiative to help themselves. What better symbol for our garden, which also holds forth medicine to all while empowering us in caring for ourselves and each other?